The Cathedral of Our Lady of the Assumption (Catedral Metropolitana de Nuestra Señora de la Asunción) is an imposing sight on the Alameda de León in Oaxaca's city center. The cathedral, whose construction began 1535, had to be extensively rebuilt in 1730 after a series of earthquakes and fires, which explains its solid walls and asymmetrical towers. 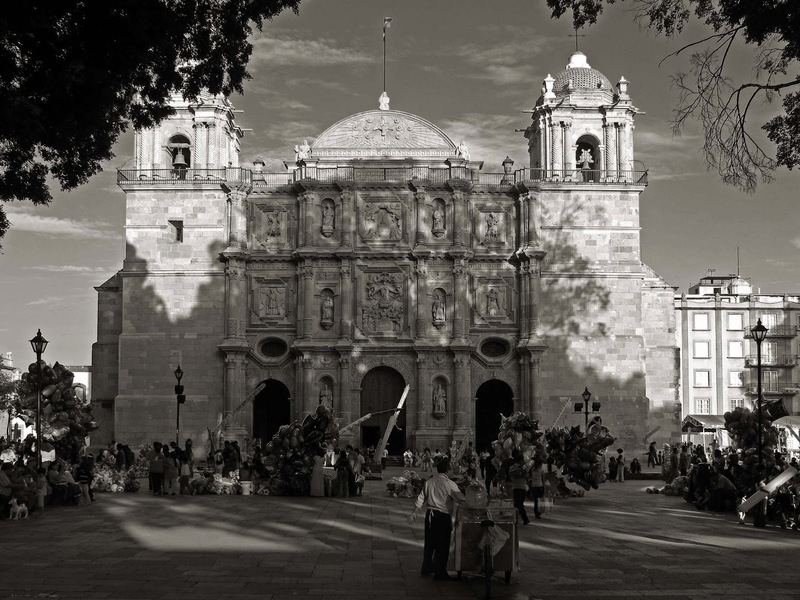 The Cathedral is the seat of the Roman Catholic Archdiocese of Antequera, Oaxaca. During construction the Temple of San Juan de Dios served as the cathedral of the diocese. In 1640 the seat of the diocese was transferred to Our Lady of the Assumption. Due to earthquakes in the 16th and 18th centuries, the cathedral had to be reconstructed several times, with the most recent reconstruction beginning in 1702 and finishing in 1733. Its facade is made of green cantera stone commonly found in Oaxaca's buildings, and the interior is in Neoclassical style. The altar features a bronze statue of Our Lady of the Assumption (Nuestra Señora de al Asunción) made in Italy during the Porfirio era by Tadoini. The towers of the cathedral are not the originals, which were destroyed in a 1931 earthquake. 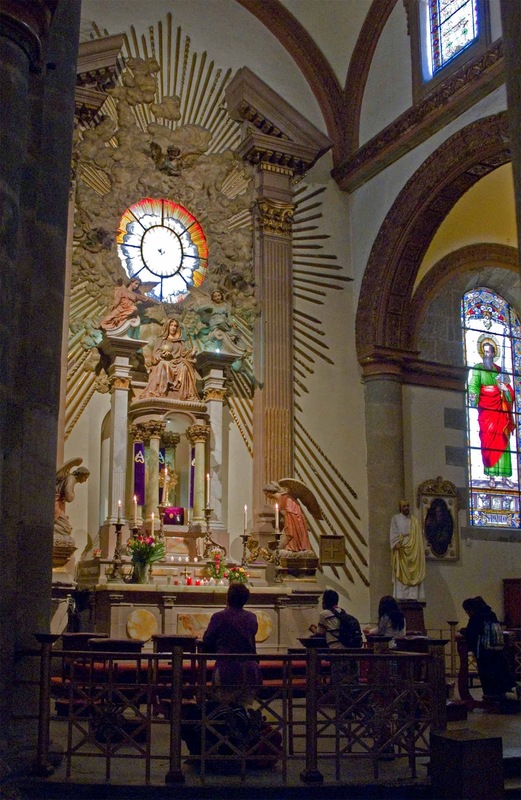 In the south tower there is a clock donated to Oaxaca by King Fernando VII. A chapel at the back of the church, left of the altar, houses the revered crucifix of El Señor del Rayo (Our Lord of the Lightning Bolt), the only piece to survive a fire that started when lightning struck the thatch roof of the original structure. The second chapel on the right contains the remains of the Cross of Huatulco. Against the west wall of the choir is a locally built baroque pipe organ, parts of which date to 1711-1712, restored in 1997. The interior was plundered during the Wars of Reform, so is not as interesting as the intricate exterior. 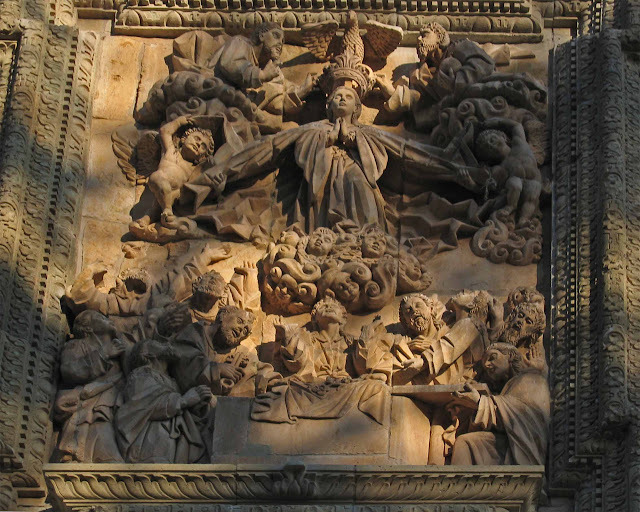 The cathedral's attractive Baroque façade includes a fine relief of the Assumption of the Virgin Mary above the central door. The heavy, elaborate frame around the picture and the highly stylized wavelike clouds next to the cherubs are distinctive features of Oaxacan Baroque. An uncommon and quite lovely detail is how the Virgin's cape and its folds are depicted in angular lines and facets. For more views please visit my picasa web album.